Heck–this isn’t even vanity! 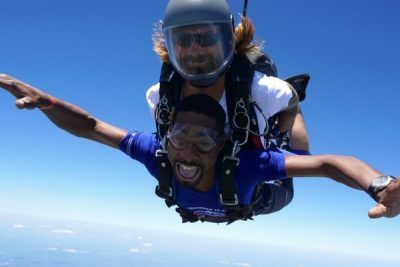 The photos and video from your tandem skydiving experience are going to have a serious moment in the social limelight, so you’ll certainly want to put your best foot forward when you share them and work that video for all it’s worth (which is, coincidentally, a lot). 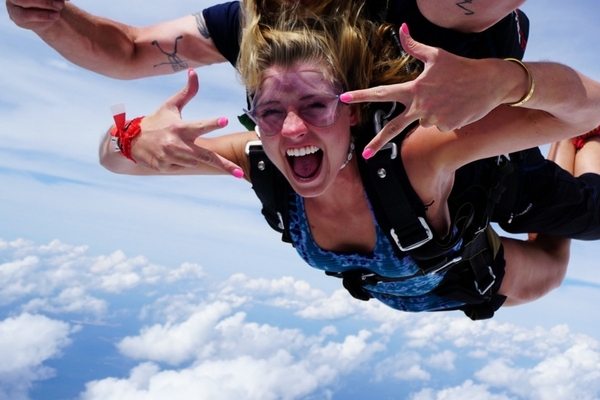 Luckily, looking great in a skydiving video isn’t the impossible task that it seems. 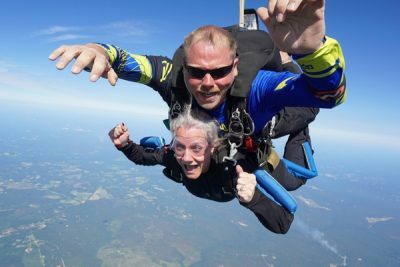 With a little coaching, anyone can look awesome popping ecstatically out an airplane and pirouetting around in the wild blue yonder. 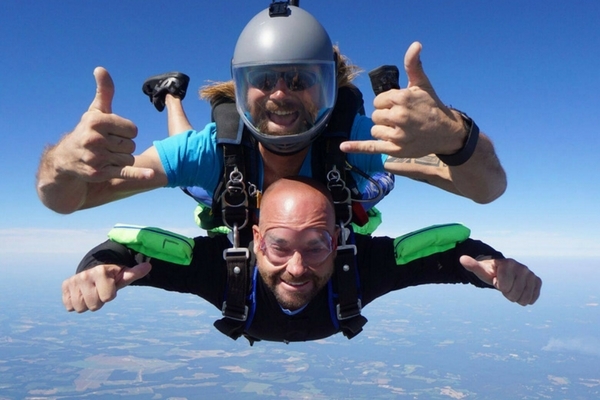 Lined up below are our very best tips for looking good in a skydiving video–and we know what we’re talking about, ‘cause we’ve seen thousands. 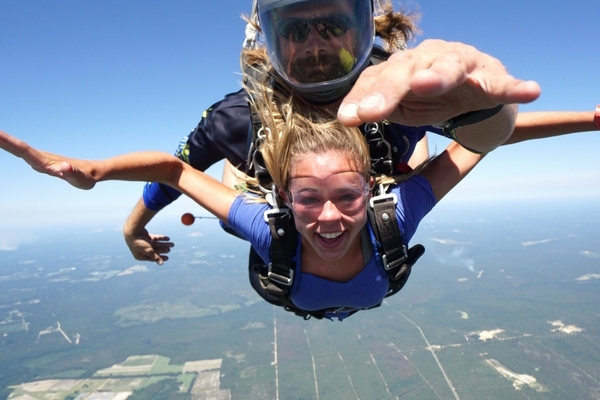 Close-fitting layers are the safest, most comfortable choice for skydiving. 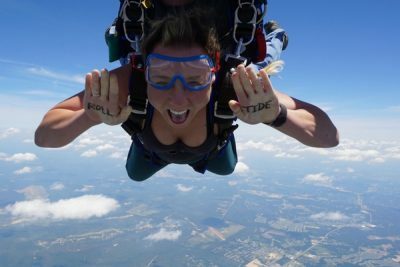 Because of the atmospheric phenomenon known as “lapse rate,” it’s significantly colder up there, so your tank top is likely to leave you shivering–but, on the other hand, bulky layers flap around in a seriously awkward, uncomfortable way. Aim for a balance: a base layer with a long-sleeved, fleece-weight-or-less (depending on the season) layer over that. 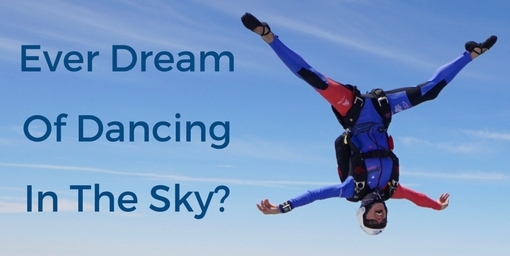 We’ve found that there’s a certain configuration that delivers the most flattering photos and videos and the most comfortable skydive, for both men and women. 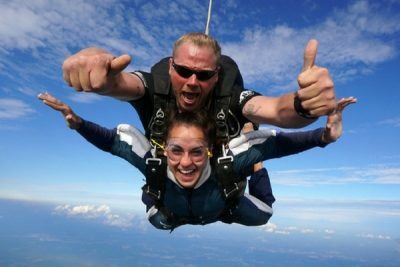 For the top half: a close-fitting long-sleeved top with thumb loops and a crew neck that’s long enough to go down over the hips and tuck firmly below the tandem skydiving harness. For the bottom half: long yoga or athletic pants. For both, choose either darker or very bright colors, neither of which will disappear against the dazzling blue of the sky. Play with the camera! 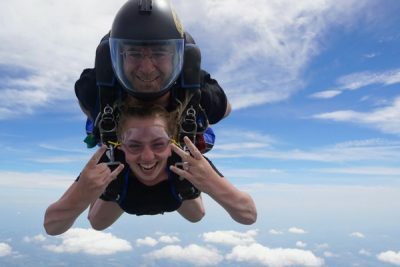 This is your freefallin’ photo shoot, after all. Keep your head up! If you look down at the earth below, your photos/videos won’t look as good, because the focus will be of the top of your head instead of your beautiful face. For bonus points, shoot the camera a cheerful two-thumbs-up. The struggle of FLS (“Flapping Lip Syndrome”) is real. When you forget to smile on a tandem skydive, the relative wind is going to have its way with your face. To retake control of your cheeks, muster a megawatt smile. That’ll have two benefits: to keep your face from exploding in wonky ripples and to show the world how confident, composed and gosh-darned happy you are in that landmark moment. Right! So–you have your orders, then. Commit this to memory and let’s get ready to look so good!